More than a month into a partial government shutdown, the U.S. Department of Transportation indicates that it’s business as usual for trucking regulators and officials responsible for the country’s surface transportation network. None of the Federal Motor Carrier Safety Administration staff of 1,158 nor the Federal Highway Administration’s 2,682, have been furloughed amid the interruption of funding to DOT’s operating accounts, caused by the stalemate between President Donald Trump and Speaker of the House Nancy Pelosi (D-Calif.) over paying for a wall along the Mexican border. The shutdown began Dec. 22. JAN. 25 UDPATE: Trump agrees to plan to end shutdown til Feb. 15. FMCSA “has sufficient balances of liquidating cash to operate for a limited period during a lapse of annual appropriations,” according to the department’s “Plan for Appropriation Lapse” guidance, revised as of Jan. 11. DOT’s plan also noted that FHWA has sufficient funding to continue operations during a lapse in congressionally appropriated funding. Reached by Transport Topics, a DOT spokesperson did not expound on the department’s guidance. The situation is far different for staff at other agencies within DOT. For instance, the Federal Aviation Administration furloughed 13,944 positions out of 44,687. During the shutdown, FAA suspended law enforcement assistance and air traffic performance analysis, among other functions. The National Highway Traffic Safety Administration furloughed 330 out of 587 staffers. Certain rulemakings and investigations of defects have been suspended, among other activities. And, the Federal Railroad Administration furloughed 420 out of 935 positions. Suspended activities at FRA include grants, and financial and technical assistance for Amtrak. Both FMCSA and FHWA are backed significantly by the Highway Trust Fund account, which operates through revenue generated nationwide from the 24.4-cents-per-gallon diesel tax, and 18.4-cents-per-gallon gas tax. The trust fund’s authority expires next year. The leadership at the U.S. Coast Guard and groups representing air traffic controllers and personnel at transportation security checkpoints have warned about possible disruptions amid low morale, as staff are working without being paid. About 800,000 employees have missed paychecks during what now ranks as the longest shutdown in the country’s history. Against that backdrop, congressional leaders continue to press ahead with the aim of reopening affected agencies. The Democratic-led House on Jan. 23 advanced by a vote of 234 to 180 fiscal 2019 legislation that would provide funding for federal agencies, except for the Department of Homeland Security. The following day, the House, by a vote of 231 to 180, advanced legislation that would fund Homeland Security through Feb. 28. Neither bill included Trump’s request of $5.7 billion for a wall along the Mexican border in his bid to battle illegal immigration. Two proposals in the Senate, however, failed to advance: procedural votes on a Republican-backed bill that would fund the government and provide $5.7 billion for a “physical barrier along the highest priority locations of the southwest border,” and a proposal sponsored by Senate Minority Leader Chuck Schumer (D-N.Y.) that would fund federal agencies through Feb. 8 without funding for a barrier or wall along the southern border. Sen. Patrick Leahy of Vermont, the Democrats’ top appropriator, has blamed Trump for the shutdown. Trump has shot back, blaming Democrats. 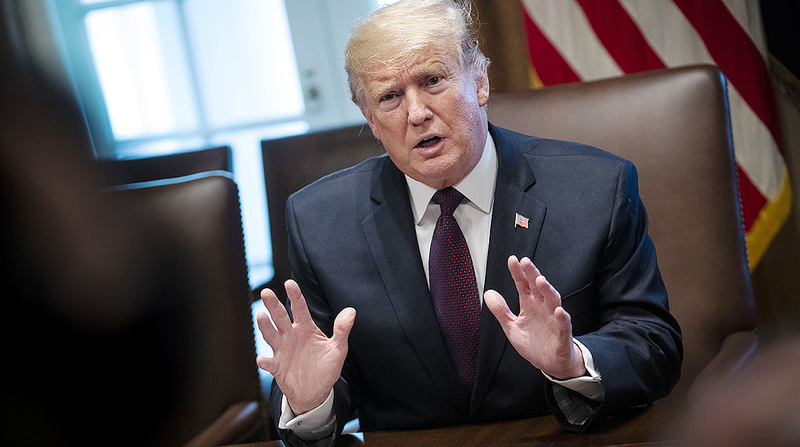 He has not relinquished his demand for $5.7 billion for a wall, which he claims would help reduce crime associated with illegal crossings from Mexico. "We have a lot of very dangerous people that want to come into our country. And we’re not letting them in. We want people to come in based on merit,” Trump said from the White House on Jan. 23.